I managed to haul myself around the London Marathon at the weekend in a respectable (for me) 3 hr 20 min. Although hard work, particularly in the last 10 miles, the atmosphere was fantastic with crowds lining the route all the way. It was a great challenge that's left me in two minds whether or not to do it again next year! My training had been a bit on the short-but-fast side with the single longest run at ~18 miles and the second longest being the Brighton half marathon a couple of months previously. Doing 9-10 milers at a faster pace, about 6:30 min/mile, seems to have sufficed. Having read the Complete Guide to Sports Nutrition, I gave a nod towards tailoring my diet for a few days beforehand by holding off the beer and aiming for a high % of calories from carbs. Lots of porridge and pasta was on the menu. According to the book, the average human body only stores enough glycogen (readily available sugars) for up to ~90 minutes of intensive exercise, after which point we begin to metabolise body fat, but at a much lower rate that can't sustain such running intensity. This means that to keep going for a full marathon, most people have to take on more sugars en-route. I got through a couple of bottles of Lucosade Sport and 3 SIS Go Gel sachets and felt much more energised compared to earlier runs with no extra sugars. The Garmin Forerunner 305 GPS watch seemed very popular amongst runners, certainly the most common GPS that I noticed. 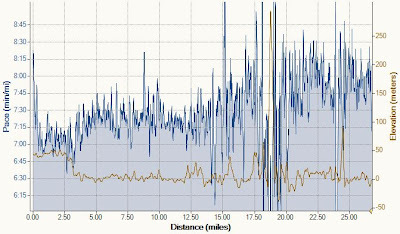 Here's my pace chart from the GPS plotted with SportTracks.